Supply Chain Strategy and Financial Metrics is a step-by-step guide to balancing the triangle of service, cost and cash which is the essence of supply chain management. Supply chains have become increasingly strategy-driven, and this Supply Chain Triangle approach puts the supply chain at the heart of the strategy discussion instead of seeing it as a result. Supply Chain Strategy and Financial Metrics fully reflects the 'inventory' or 'working capital' angle and examines the optimisation of the supply chain and Return on Capital Employed. Including case studies of Barco, Casio and a selection of food retail companies, this book covers building a strategy-driven KPI dashboard, target setting and financial benchmarking. Regular examples and diagrams illustrate how different types of strategies lead to different trade-offs in the Supply Chain Triangle. This ground-breaking text links supply chain, strategy and finance through financial metrics, therefore creating value for the shareholder. Online supporting resources include worksheets covering basic financial concepts such as cash flow and working capital, with example data sets and guidelines/exercises to make it interactive. A specialist but quite an essential book that looks at the intricacies of supply chain management and financial issues, the trinity of supply chain strategy and metrics in other words and shows how all elements should be strategically in balance for best effect. 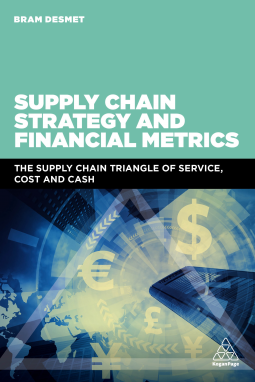 The author seeks to explain, through an accessible, step-by-step approach, the importance of balancing service needs, costs and cash flow within the supply chain, considering the position of inventory (tied-up capital). The aim is to enhance the potential return on capital and providing high levels of dependable, prompt service by the supply chain being a crucial part of strategy rather than just a cost or necessary action. Monitoring, evaluating and benchmarking the activities are essential, and a certain amount of tinkering and adjustment will be required depending on individual circumstances and more. The hard work still falls to the reader, who may need to implement or amend workflow and attitudes within their company. It is not helped by customers today being more demanding on many levels. What used to work in the past is less relevant for most businesses. Companies may need to react differently, getting their products into more markets and networks, with price and time pressures coming at them from all angles. Some case studies are used to help bring the theoretical text into real-world focus, which also can allow the reader to understand how different approaches have worked for various companies. The book's price is quite high, which unfortunately means it is unlikely to be an impulse buy for the curious reader, but for those who need (or should need) this kind of information you won't even be looking at the price tag if you examine the book and gel with it immediately. Cost is significant, going back to the book's central focus, but it is not always the only metric a customer will buy on. Differentiation and agility are also key factors, and everything has to be sustained throughout the organization - sustainability also includes financial performance too! When it comes to examining your organization, the author gives a framework that should help connect business strategy to supply chain strategy and the existing marketplace. The current customer marketplace is reviewed in depth along with marketplace behaviour before being tuned in towards the right business and supply chain strategy, performance measurement and management. One of the key aims is that once you have a revised plan in place, you continue to watch it - it should never be a 'fit and forget' component. Through the book, you will be guided how to be more observant, reactive and better placed to make minor (or major) adjustments as required too. This book is something that you quite rightly invest time and effort to read, understand and exploit. It is a book for doing, and there may be an element of pain in the reading process due to the sheer amount of material on offer and the degree of thought that you should give its contents. After that, the even-harder work can fall on your shoulders. You get rather a lot, for a very good price, in relatively few pages!